100 days from now, the Olympic Winter Games Pyeongchang 2018 will take place. Today, the United States Olympic Committee unveiled Team USA’s closing ceremony uniforms, designed by Polo Ralph Lauren, the official outfitter of the U.S. Olympic and Paralympic Teams for the sixth Olympic Games in a row. 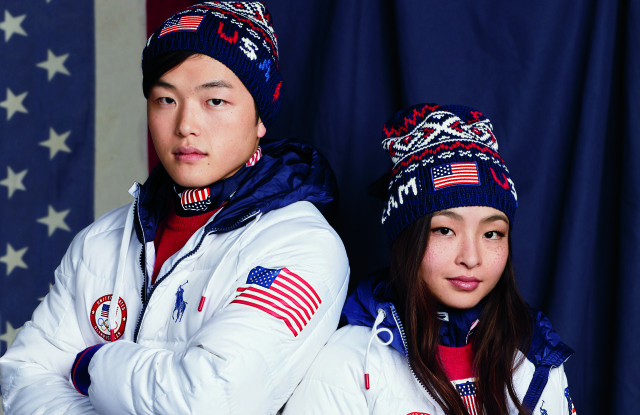 Olympians Alex and Maia Shibutani in the 2018 Team USA Closing Ceremony Uniforms. The uniforms worn for the closing ceremony parade are done in patriotic shades of red, white and blue, and include a white water-repellent down jacket; navy double-fleece pants with red stripe detailing, and a vintage ski-inspired sweater in a bold red, white and blue block stripe. They are accessorized, by wool gloves with a winter-inspired intarsia pattern and a matching ski hat; a graphic bandanna featuring the American flag, and brown suede mountaineering boots with red laces. As always, Polo Ralph Lauren Team USA Collection will be available next month in select Ralph Lauren and Polo Ralph Lauren retail stores as well as Team USA Shop!